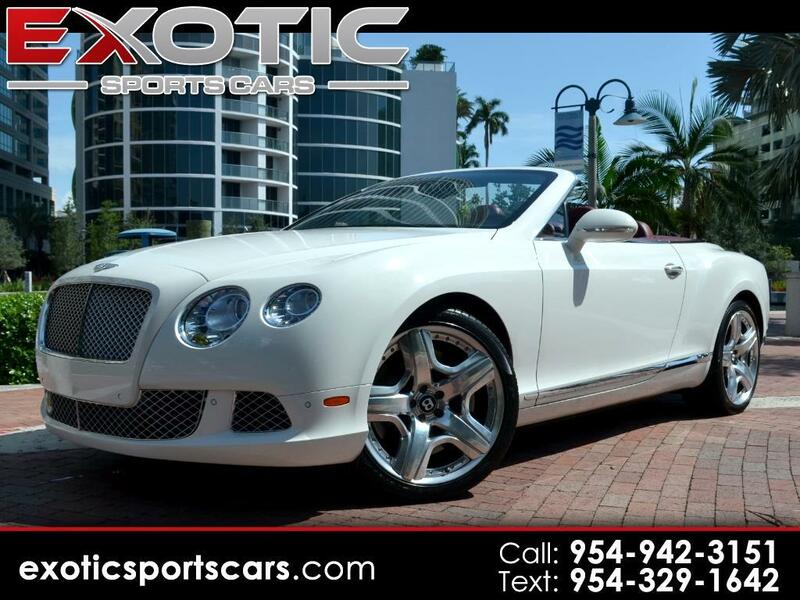 Exotic Sports Cars is proud to present this breathtaking 2013 Bentley Continental GTC. Finished in Glacier White over Fireglow hides, the Continental GTC has been driven very few pampered miles by only TWO previous owners. It has been expertly maintained by a Bentley Technician and is in superb condition from top to bottom. This Bentley is built as standard with nearly every luxury amenity known to man, but has been further optioned with the Mulliner Specification Package, Knurl Gear Shifter, Indented Leather Hide on the Cabin Headlining, Drilled Alloy Sport Pedals, Jewel Fuel Filler Cap, Quilted/Perforated Door Panel Hides, Bentley Seat Emblems, Front Seat Ventilation and Massage, Neck Warmer, 3 Spoke Wood & Leather Steering Wheel, Adaptive Cruise Control w/ Follow to Stop Feature, and Veneered Door & Rear Quarter Inserts. There is nothing else to desire! Bentley's acclaimed Continental GTC represents the finest in open-top English Grand Touring motorcars. Redesigned for 2012, it is motivated by a wonderful twin-turbo 12-cylinder engine that routes 567 HP through a sophisticated all-wheel-drive system. The Continental GTC's body is a work of art, where crisp and muscular lines meet classic details and exceptionally rich paint. Lovely hand-stitched hides and breathtaking wood veneers grace the beautifully appointed cabin, while high-tech amenities ensure your drive will always be a pleasure. And what better way to enjoy this graceful English motorcar than with the top down?If you are in the market for a fine example of Bentley's Continental GTC, well-maintained and in a classy color scheme, Call us today, 954-942-3151! Message: Thought you might be interested in this 2013 Bentley Continental GTC.